Welcome to the interactive Midgard Map, a suite of digital tools for the Midgard World setting by Kobold Press. Click and drag the map to move it around. The mouse wheel or zoom buttons to the right will zoom the map in and out to various zoom factors. On the right hand side you will find zoom, pathfinder mode, and layer controls to turn on and off various markers and map options. The hex map is scaled at 50 miles per edge of each hex and 100 miles across at the longest points. The other sections of this sidebar contain detailed information on using various tools, a help section, a Filter and Search tool, and attribution information. Please be aware that this map may not be fully usable on mobile devices, smaller screens, or through screen reader software. The interactive midgard map is © 2019 Open Design LLC. Midgard is a trademark of Open Design, LLC. Midgard is a large world, and there are many areas requiring more detail than the world map can provide. Click on the submaps below to go to the various city and region maps currently available. You can scroll up and down the location list, or filter by name or type by entering the desired search term in the filter. Clicking on a location will center and zoom the map there. 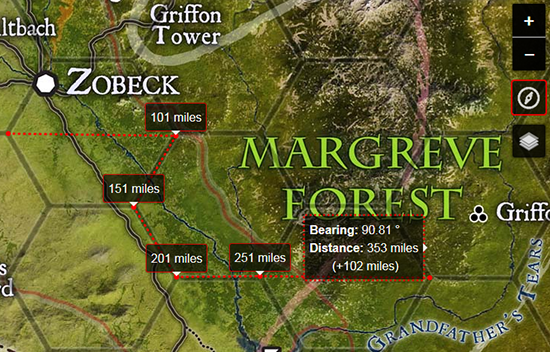 To ease your journeys in the realms of Midgard, we've provided a Pathfinding tool that can help determine distances. Click on the Compass Icon in the right hand tools section. You are now in "Pathfinder" mode. When you click a location, it will mark it as your start point. Move your mouse to draw a line with a tooltip that shows bearing and distance. Click again to set a point in the journey. When you are done, double click to close the path, or press the ESC key. Press ESC again or click on the compass icon to turn off the Pathfinder tool. Thanks to Chris Sniezak of the Misdirected Mark network for coordinates and content help. Content for 3 more submaps (Cindass, Triolo, Nuria) added. Sidebar content redone to accomodate submaps. Content for 3 submaps (Zobeck, Konigsheim, Per-Bastet) finished, proofed, and released. Grid and political maps incorporated. Moved all markers to marker layers. Redid sidebar coding for better mobile responsiveness. Better help documentation for features. Initial Map Coding with leaflet.js library. The search and filter feature in the infobar on the left will allow you to search map entities by their name or category. The Pathfinder tool (compass icon) lets you measure the distance along paths. Find detailed info in the Pathfinder tool sidebar section. You can turn various map versions on and off with the layers control to the right, including the hex grid map and the political boundaries map. The hex map is scaled as 24 miles across each hex.